I love camping. I mean, I could (and have) lived in a tent for extended period. When I was younger, and in Boy Scouts, my favorite part of any summer was when we went camping. Especially backpacking – when you have to have everything along with. It felt like we were off on our own, but (of course) there was probably some sort of rescue plan in place. This was the 80s, though, so no SPOT trackers or cell phones. Maybe it was smoke signals? Now camping is a thing, and the amount of money you can spend on equipment is stunning. 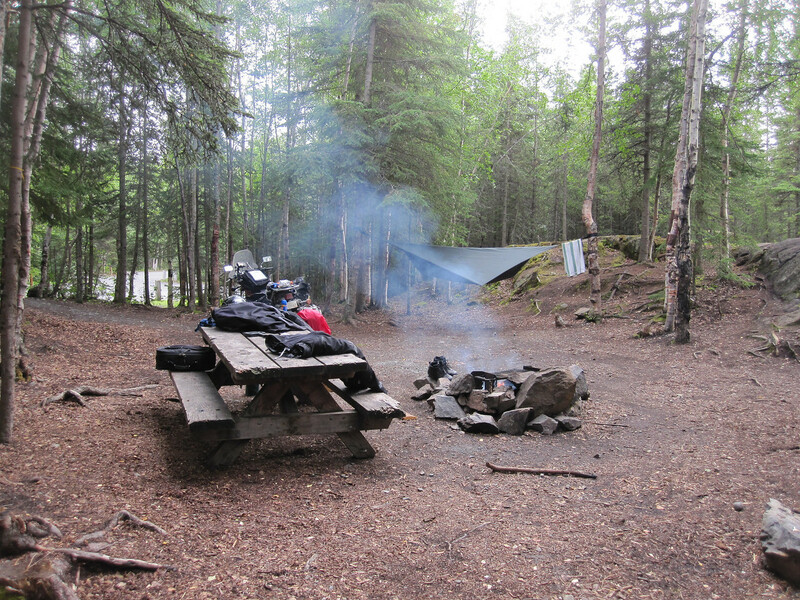 For motorcycle camping, most try to be minimalist, bringing with enough to be comfortable without adding too much in the way of bulk or weight. Because of this, we tend to get backpacking equipment, which is lightweight and small – since backpackers have space issues like we wouldn’t believe and have to carry all their stuff (including food and water). But the truth is, we don’t need to limit ourselves in this way. Some manufactures, and riders, have also learned this and started making or using motorcycle specific tents, some large enough to park the motorcycle inside. While I like that many riders are moving away from the small, high-tech and expensive backpacking tents, moving to large, high-tech, and more expensive large ones isn’t much better. I thought we could break down camping, and what you really need and don’t need to get a good nights sleep on the road. Get a Good Bag and Pad – By far the most important things you need – and where you should spend the most money, is your sleeping bag and pad. Don’t worry about getting down and the chance it might get wet. You can carry it in a waterproof stuff sack, but it’s more likely it will never come out of it’s bag unless you are in your tent, and down is simply better than even the newest synthetic (though synthetics are catching up). The pad is the same – get a good one with some insulation. It might have a little more bulk than one without insulation but if the ground is cold that insulation will be worth it. Don’t Spend More on Your Tent than Your Bed – This is a simple rule that you might find really difficult to follow. Your pad and bag should be where most of your camping gear money should be spent. You tent shouldn’t cost more than those things do. Ultimately, the purpose of your tent is to protect you from weather conditions – wind and rain or whatever else you happen to find yourself in. The bag and pad are what will keep you actually comfortable while you are sleeping, which matters. For almost ten years I traveled with a $25 Walmart tent with fiberglass poles and heavy tarp-like floor. I wouldn’t want to carry it very far, but it was fine on the motorcycle (or short hikes to walking camps) where the bulk and weight were less of an issue. Tents can Get Wet – This is something I hear regularly. “I got this tent because it fit in my pannier.” I do carry most of my current tent inside a dry bag – but that tent is a hammock, and most of it isn’t waterproof. When I am carrying a traditional tent, it’s strapped to the back seat out in the open. Tents are able to get wet, and the idea of carrying my inside my backpack growing up would’ve seen insane. And yes, I know some of you will start thinking about security and “someone will steal my tent!” I still haven’t any anything taken from my motorcycle, and even if I do I will still try to believe most people are good, rather than the alternative. Be Careful with Accessories – Camp stools, camp chairs, rugs, extra pillows – some of these things are the difference between wanting to camp, and getting a hotel at the end of the day. If that’s the case, then I guess you would carry them – but it all adds up in terms of bulk and cost. When I carried a chair (I’ve stopped recently – hammock) it was a $5 umbrella chair from a bin full of such chairs at a Walgreens. It was plastic and metal, and held up to all abuse I hurled at it, and took minutes to set up and take down. When it fell off the motorcycle on a small back road, while I was sad about losing something I’d had for so long, replacing it was simple and not a huge hit on the budget. You can camp, have it be affordable (which should be part of the point), and not carry so much extra equipment that the motorcycle is overloaded. As with so many other things, using some common sense and forethought, as well as being aware of how much things cost in terms of lost travel money, helps. Glad to see someone finally getting it about small displacement touring. I mean, I’ve been riding for 10 years now and had 8 bikes in total from 650 to 1200 cc. I now ride the smallest bike I ever owned, which is also a 250cc and never had that much fun! For me I had to ride big bikes to really appreciate the small bike. I’ve started on small bikes in the 90s, and “upgraded” to a liter bike in the mid-2000s. Later I realized I wasn’t seeing all the things I wanted to see – the big bike just had riding past all this stuff and telling myself “I’ll be back.” Now that I’m on a small bike again I stop and look at those things – and love traveling more than ever. I totally agree. I started with backpackers camping stuff and quickly realised that it didn’t need to be that small or that light. That is especially true for sleeping mats. No use waking up feeling like crap. In regards to chairs – check out Helinox gear, small light and comfortable. I really do think the most important camping gear (and where you should spend your money) are the sleeping bag and pad. How well you sleep has such a huge impact on the rest of your trip. I have looked at those chairs – they are comfy and pack small, but I still like the $5 umbrella ones.